have made this iconic diner famous! 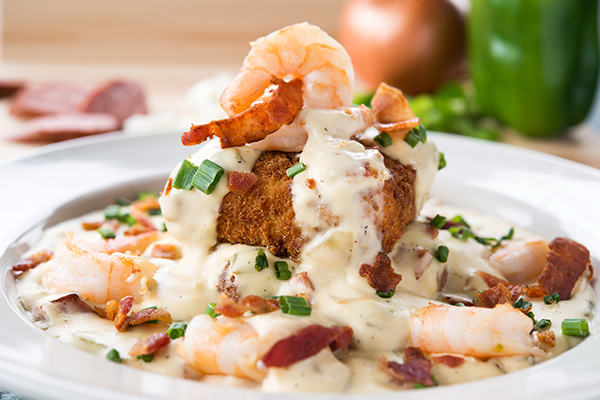 Metro Diner’s Shrimp and Grits features succulent shrimp, scallions and bacon in a creamy sauce piled high atop a deep-fried grit cake. 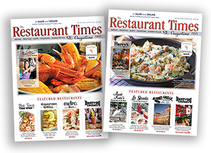 Never has it been more evident at St Augustine’s Metro Diner that, The fondest memories are made when gathered around the table, Eating comfort food with flair, than in the last 5 months under the direction and leadership of managing partner, Scott Stegmaier. Every guest is immediately welcomed and made to feel right at home. It takes only moments before your taste buds come to attention, and your month begins watering as you read the innovative daily specials proudly displayed on the wall-size chalkboard. Whether you choose one of the made-from-scratch specials or one of the many award-winning favorites from Metro Diner’s famous menu such as Yo Halla Stuffed French Toast, Fried Chicken and Waffles and slow-cooked Pot Roast, you know you’re coming back here to eat again! And you’re bringing your family and friends. The atmosphere is lively—the hustle and bustle of smiling, friendly servers carrying big portions of comfort food to tables is met with wide-eyed guests watching every plate go by, laughing and talking as they anticipate their order coming! Scott works the room—greeting diners, helping servers and talking with guests at every table. He wants guests to feel like they are part of the family and know that Metro Diner is now proudly serving dinner, as well as breakfast and lunch. You may even learn about his work with the founders of Metro Diner, the Davoli family, and with Chef Mark Davoli, Metro Diner’s culinary director, to research and develop new recipes. Odds are someone will challenge you to find better fried chicken anywhere. Metro Diner's history had humble beginnings as a single Jacksonville eatery founded initially in 1938. It was known as a favorite breakfast spot of Jacksonville locals. 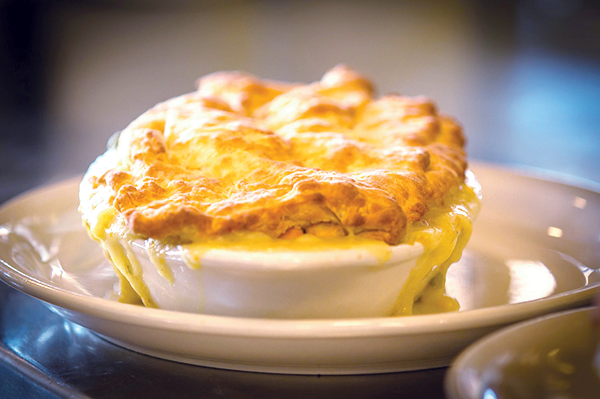 Because Metro Diner’s founders cook for the love of food, it was inevitable that word spread about Metro Diner and locals and visitors alike brought family and friends to experience the big portions of classic American comfort food with flair. In July 2017, Food Network’s Guy Fieri of Diners, Drive-Ins and Dives visited the Jacksonville location. Today, framed pictures of Guy Fieri are displayed on the walls in many of Metro Diners’ locations from Jacksonville to South Florida. Fieri can be seen sampling favorite Metro Diner recipes while socializing with the Davoli family, servers and guests. 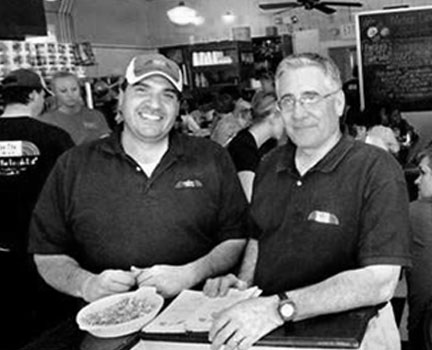 Metro Diner has been serving satisfied customers for more than 25 years. Metro Diner opened its St Augustine location in March of 2015 and was an instant sensation. St Augustine’s Metro Diner has one busy parking lot any time of day. That’s because guests experience warm, welcoming service and award winning food for breakfast, lunch, and dinner. When you choose the Metro Diner, you will be treated like family as you enjoy big portions of comfort food with flair prepared and served all day, with care and style. Metro Diner is open daily at 6:30 a.m.
Yo Halla Stuffed French Toast is a breakfast menu favorite. 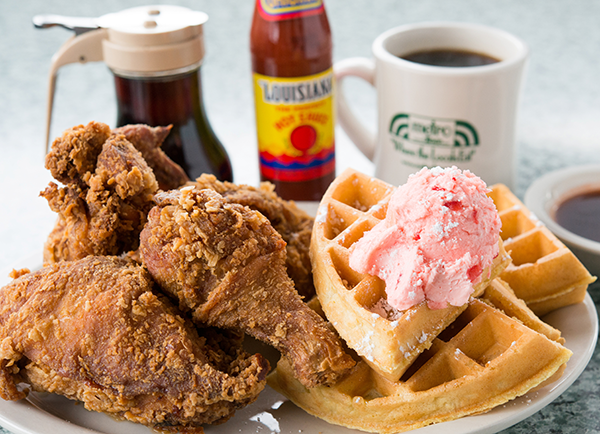 Chicken and Waffles—a Metro Diner signature—is served with a side of maple syrup mixed with hot sauce for the ultimate flavor sensation. Chef Mark Davoli and his father, John Davoli, founders of the original Metro Diner in Jacksonville, Fla.
Classic Chicken Pot Pie is sublime. 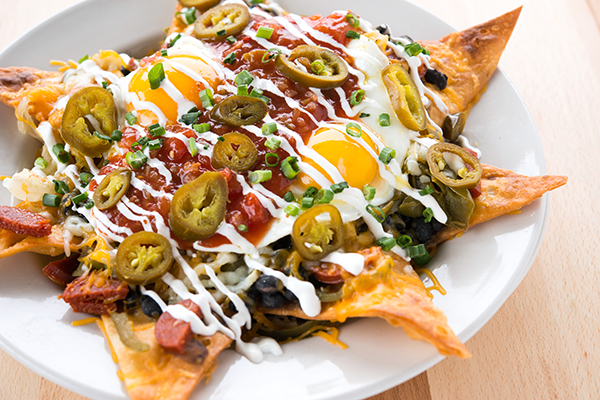 Huevos Rancheros add a bit of spice to your morning!